Established in 1972 by four brothers with just four buses, Bus Queensland is one of the largest privately owned bus companies in Australia operating a modern fleet of 414 buses in Queensland and Victoria. For over 40 years they have provided school and urban transport services for greater South-East Queensland area. At Bus Queensland we are a part of the local community and committed to making your journey on our buses safe and comfortable. Bus Queensland is one hundred per cent Queensland owned. We have conducted transport businesses in Victoria and Queensland for more than 40 years and now employ 350 staff across the four depots in South-East Queensland. Our depots in Queensland service the Ipswich, the Lockyer Valley, Park Ridge and Toowoomba areas and the group operates two Victorian bus companies, Cranbourne Transit and the Mansfield-Mt Buller Bus Lines. Established in 1972 by four brothers with just four buses, Bus Queensland has grown to become one of the largest privately owned bus companies in Australia operating a fleet of 414 buses in Queensland and Victoria. 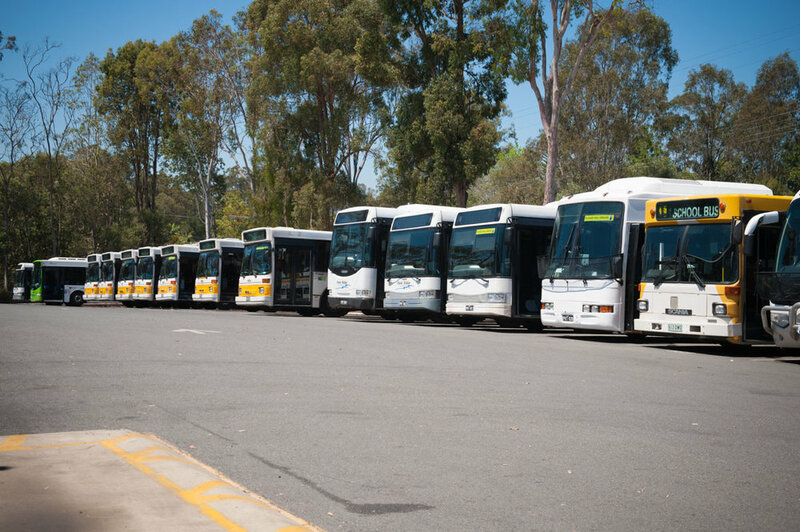 There are four depots in Queensland servicing the Ipswich, the Lockyer Valley, Park Ridge and Toowoomba areas and the group operates two Victorian bus companies, Cranbourne Transit and the Mansfield-Mt Buller Bus Lines. Bus Queensland is part of the Pulitano Bus group and has conducted transport businesses in Victoria and Queensland for more than 100 years. They now employ 350 staff across the four depots in South-East Queensland. The Pulitano Bus group history includes a string of strategic bus line acquisitions over the years, serving to grow the group to become the operator of choice in their targeted regions. 2012: In February 2012 the Ipswich depot (Westside Bus Co) was awarded a rail extension service requiring four additional buses. 2010: was a big year for the Pulitano Bus Group acquiring nine special school contracts from Pemville Pty Ltd and becoming the school bus operator for the Laidley region, this included taking over 18 vehicles. 2009: The Pulitano Bus Group acquired two more bus routes after buying Toowoomba Transit Pty Ltd and Sunbus, the two bus route operators in the Toowoomba region, including their 70 vehicles. 2008: Seven more buses are acquired after buying Woodhill Coaches in the Woodhill area and Northern Bus Lines is sold for $21.5 million after growing to a fleet of 32 buses. 2007: After the retirement of two key players in the Pulitano Group, a decision is made to restructure appoint a new Chief Executive Officer, Chief Financial Officer and establish an independent advisory board. Another seven buses are acquired after buying Williams operation in the Greenbank area. 2004: The Group has successfully negotiated and obtained the TransLink contract for two depots, Westside Bus Co. and Park Ridge. 2003: The Group acquires Cranbourne Transit along with 24 buses. 1999: In October Stagecoach School Services is acquired and in December along with the Transit Australia Ipswich operation, consisting of 32 buses altogether. 1998: One of the group’s major depots, Westside Bus Co including its 15 buses, is purchased by the group and the renewal of the Northern Bus Lines route is successfully negotiated. 1993: The Pulitano Group buys Mansfield Mt Buller Bus Lines, including its 40 buses and depot. 1989: The Beaudesert to Brisbane Service and A.C.T Coaches are acquired. 1988: The Pulitano Group purchases another of their depots, Park Ridge Transit, three hotels in Mt Buller in Victoria and begins providing all bus and land cruiser services in and around the Mansfield/Mt Buller region. 1980: The Pulitano Group decides to sell their Williamstown Services and five buses. 1975: Northern Bus Lines including 16 buses is purchased. 1972: The four Pulitano brothers, Francesco, Cosimo, Filippo, and Giuseppe, begin their family empire by acquiring four buses for their Newport to Williamstown Service.